Direct Lease Driver of the Month, Edward Worthen, Milton, Wash., is a veteran driver with more than 40 years of experience as a professional household goods mover. He maintains a good driver rating with a top score in customer service. 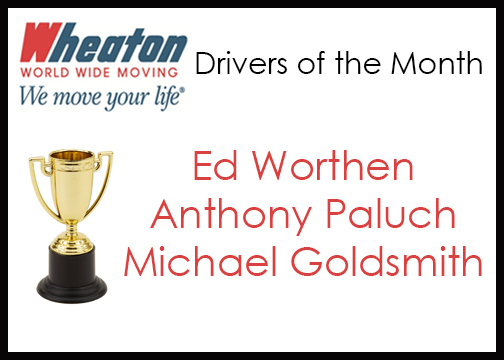 This is Ed’s second Driver of the Month award with our company. Anthony Paluch, Pikes Peak Moving & Storage Co., Inc., Colorado Springs, Colo., earned Wheaton’s Permanent Fleet Driver of the Month award. Tony has over 16 years of experience as a professional mover. This is his third Driver of the Month award. Michael Goldsmith, Crown Moving & Storage, Indianapolis, Ind., earned Wheaton’s Intermittent Fleet Driver of the Month award. Mike has more than 16 years of experience as a professional mover. This is his second Driver of the Month award.